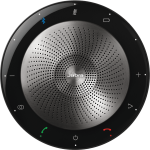 We recently shared the announcement of the Jabra Speak 710 speakerphone (read the announcement here). We now had an opportunity to try it out for ourselves and it did not disappoint. We’ve all heard that good things come in small packages and the Jabra Speak 710 is no exception. Inside the rather plain brown box packaging is the Jabra Speak 710 speakerphone packed in its matching neoprene pouch, the Jabra Link 370 USB adapter, a Quick Start Guide and the usual warranty paperwork. The front of the Speak 710 has a touch sensitive panel around the outer edge. This is used to pair the Speak 710 via Bluetooth®, connect or disconnect from a call, adjust volume during a call and activate Siri. Volume is indicated by a series of white LEDs that illuminate around the outer edge of the Speak 710. Battery level is indicated by touching the battery symbol. The white LEDs now illuminate as green and light up in a clockwise direction starting at the power button, at the bottom of the front ring and continuing around the outer edge. When the lights go all the way around, the unit is fully charged. Tucked neatly on the back on the Speak 710 is the Bluetooth® 4.2 Low Energy (BTLE) dongle and the built-in stand. 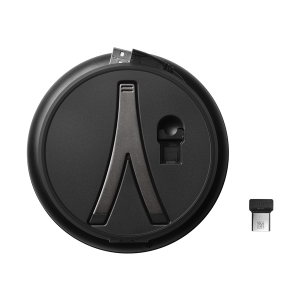 The Speak 710 has an attached USB 2.0 (Type A) cord wrapped around the outer edge which allows direct connection to a Mac and is also used to charge the built in battery. Out of the box, our Jabra Speak 710 had about 50% of a full charge and with a rated 15-hour battery life that would still get us through at least one full work day. A full battery recharge takes about three hours. We appreciated that Jabra included a carrying case. Weighing in at just 10.5 oz., the Jabra Speak 710 is small enough and light enough to fit in a backpack, carry-on bag or large handbag and take it on the road and the case will provide adequate protection from minor bumps. The size and shape of the Speak 710 makes it easy to find a spot on even the most crowded of desks. The unit is designed to lay flat on a desk or table or can sit upright by pushing out the included stand that is attached to the back. Compared to some of the other brands in this category, we especially like the compact size and shape of the Speak 710. The include BTLE dongle fits into a recess next to the stand. We like that everything is contained in the main unit with less chance to lose something or forget to pack it on your way out the door. The Jabra Speak 710 is advertised as a speakerphone for both conversation and music listening. We tend to use our iPhone as a speakerphones so we were interested to see how the Jabra Speak 710 compared to the plain iPhone. To put it simply, having used the Jabra Speak 710 for a series of calls, it will be tough to ever go back to just using our iPhone. We found the sound quality on our calls to be excellent. There was no whistle or feedback and the voices on the other end of the calls were clean and crisp. Using our iPhone, we sometimes have trouble getting enough volume to hear the other party. Using the Speak 710, we found ourselves lowering the volume on the speaker to anywhere from 50 to 75% of maximum, which left plenty of volume to spare. The omnidirectional microphone had no trouble picking up voices from any side of the Speak 710 and when we asked parties on the other end of the call how we sounded they all agreed our voices were very clear and easy to understand. Some said they could tell we were on a speakerphone but also asked if we had called from a landline because the call was so clear. Adjusting the volume during a call merely requires a light touch on the + or – on the face of the Speak 710. The volume of the speaker is linked to the iPhone so they raise and lower together and the sound level stays nicely balanced. Putting a call on mute turns all of the LEDs red. 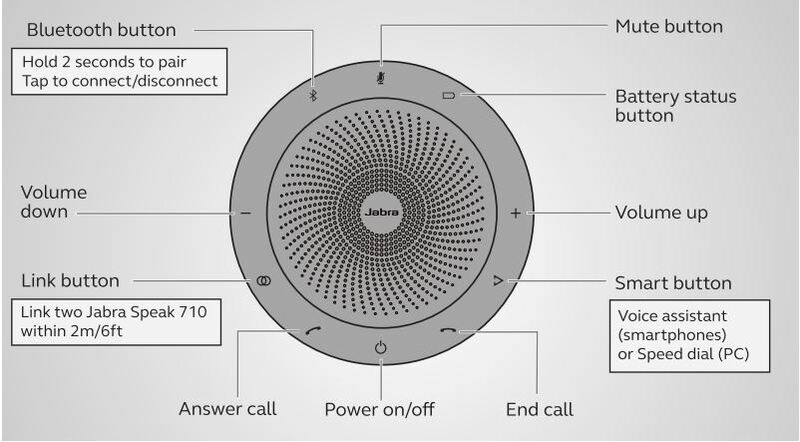 The Jabra Speak 710 has dedicated buttons to start and end calls as well as activate Siri. That means that in many situations, you won’t need not even touch your phone to make a call. 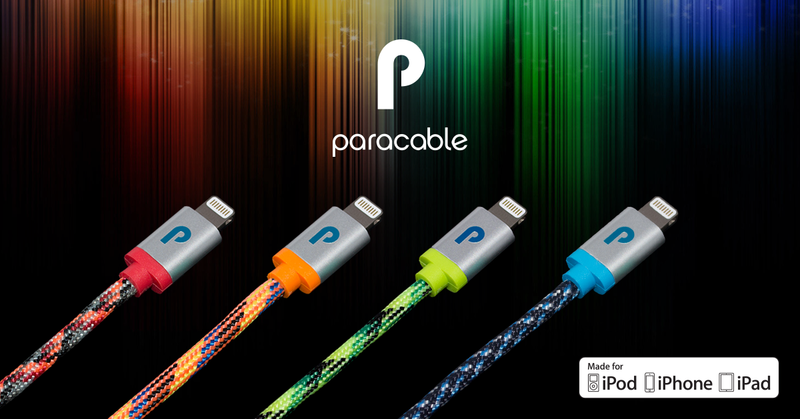 With a Bluetooth® range of 30 feet for the iPhone and 100 feet for the Mac, using the included BTLE adapter, you could even leave your phone in your pocket or purse all day. Music playback on the Speak 710 was acceptable and certainly superior to the internal speakers of our MacBook Pro but we would not recommend if you are a true audiophile. We found the music to be clear with plenty of volume but it seemed to lack some of the deep bass or high end range that you would want as a primary speaker system, like the Bose Companion 2 speakers (read our review here). We don’t want to give the impression that the Speak 710 isn’t good for listening to music. We see that as an “add-on” to its primary purpose of being a speakerphone. In addition, with Siri now included in the latest version of MacOS, you can use Siri to play a particular song, album or playlist without interrupting your workflow. The Jabra Speak 710 is recommended for groups of up to six (6) people. If you have a large room or a large conference table setting, the Speak 710 has the ability to be linked to a second unit and can be placed up to six (6) feet away from the first unit. You can also link two units to provide stereo sound. All of this is done without wires which keeps a nice clean look on a desk or office. Jabra is serious about the Speak 710 being a contender in this space. The Speak 710 has been certified for use with Microsoft (Skype for Business), Cisco, Avaya, Mitel, Citrix and other well-known IP phone hardware as well as popular on-line meeting services including GoTo Meeting, Cisco WebEx and JoinMe. The Jabra Speak 710 is a great additional for any situation. 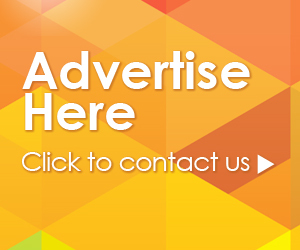 We can certainly see it being used on the desk of a private office or in a conference room. But we can also see it as a perfect addition for someone who works from home or just prefers to use a speakerphone in their home. The circular design is efficient and won’t clutter a desktop and the built in stand gives additional options to help keep it handy without getting in the way. With an MSRP of $299.00 it tends to be among the higher priced units in this category but we think the overall design of the unit, coupled with the superior sound quality, easy portability, 15-hour battery life, and the quality that comes from Jabra products in general, it’s easy for us to say, the Jabra Speak 710 is worth the money. The Jabra Speak 710 is available from Amazon and is also featured in the Audio section of the Apple Tech Talk Marketplace. If the Jabra Speak 710 does quite suit your needs, check out the complete line of Jabra Speak speakerphones. We would like to thank our friends at Jabra for providing a Jabra Speak 710 for our review.